Occam’s razor, also known as the principle of maximum parsimony, is one of the fundamental guiding principles in both logic and science. It is commonly explained as, “the simplest solution is usually the correct one.” More accurately, it states that, “all else being equal, the solution that makes the fewest assumptions is usually the correct one.” In other words, when you have multiple competing hypotheses you should default to the one that requires you to make the fewest assumptions, unless there is some compelling, evidence-based reason to think that one of the other solutions is correct. This is closely related to concept of the burden of proof, which states that the person or view making an assertion is the one who is required to provide evidence, not the person who is defending the position that the claim is being made against. As I will illustrate, both of these concepts are essentially just affirmations that ad hoc fallacies are not logically valid. Before dealing with scientific examples, I want to use some examples from everyday life to illustrate how this works. Suppose you try to start your car in the morning, and it won’t start. There is no indication that anything is mechanically wrong with your car or that anyone has tampered with it, but you notice that you had left the interior lights on the night before. Now answer the question, “why won’t the car start?” The obvious answer is that your battery was drained, but there are multiple other possible explanations for what is wrong with your car. For example, I could posit that a group of teenagers played a prank on you and sabotaged your car. I could also propose that that aliens are experimenting on how humans respond to difficulties; therefore, they sabotaged your car. In fact, there are an infinite number of increasingly absurd ad hoc possibilities (that’s why ad hoc arguments are fallacious), but obviously the battery explanation is the most rational. Why is that? What is it about the battery explanation that makes it more rational than believing that aliens sabotaged your car? Quite simply, it makes the fewest assumptions. In scientific terms, it is the most parsimonious hypothesis. That explanation really doesn’t make any unfounded assumptions, whereas the others become increasingly implausible as the number of assumptions increases. For example, the teenage miscreant hypothesis assumes that there was a group of teenage pranksters near your car last night, they had the motivation and means to sabotage your car, and they actually acted on those motivations and means without leaving any evidence behind. The alien hypothesis is even less plausible, because in addition to slight modifications of the basic assumptions required for the prankster hypothesis, you also have to assume that aliens exist, visit earth, and are interested in seeing how humans solve trivial problems. This is a basic application of Occam’s razor. The hypothesis that your battery died makes the fewest assumptions; therefore, it is the most likely hypothesis. So where does the burden of proof come into this? It arises when there is contention about which hypothesis to accept. Suppose, for example, that I was with you when your car failed to start, and you asserted that it was the battery, while I claimed that it was aliens. In this case, the burden of proof would be on me to support my hypothesis, rather than being on you to refute my hypothesis. In other words, I am the one making the unparsimonious claim; therefore, I have to support my claim, and you are not required to refute it. So, if you said, “prove that it was aliens” I could not fire back with the well-worn internet response, “well prove that it wasn’t aliens.” The burden of proof is on me, not you. This is very important to understand because people try to shift the burden of proof all the time, and it is not logically valid. 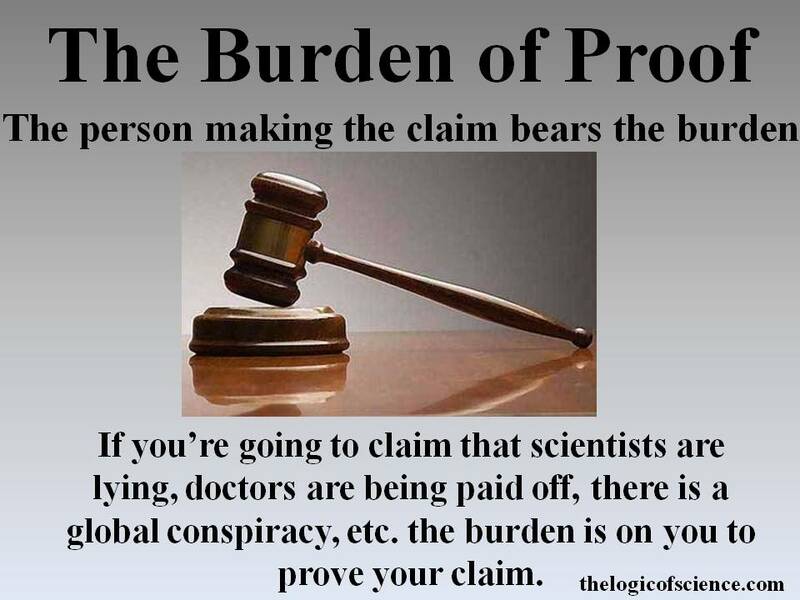 The burden of proof is always on the person making the claim. To further illustrate this, consider a courtroom example. Suppose that an expert forensic witness is brought in to testify in a homicide case, and she carefully explains why the forensic evidence clearly indicates the accused person is guilty. The defense then responds by claiming that the witness is lying. At which point, the judge and prosecutor will invariably demand proof that she is lying. The defense attorney clearly cannot simply respond by saying, “well, prove that she isn’t.” He is the one making the claim; therefore, he bears the burden of proof and must provide evidence to support his claim. The prosecution doesn’t need to provide evidence that the witness is honest because the burden of proof isn’t on them. That example illustrates a very important point: it’s not just the number of assumptions that matters, the quality of the assumptions is also important. This is part of what is meant by the, “all else being equal” clause in Occam’s razor. Technically speaking, both the defense and the prosecution are making one assumption. The defense is assuming that the witness is lying, and the prosecution is assuming that she is telling the truth, but these two assumptions clearly are not equal. Unless the witness has a past history of lying or there is some evidence-based reason to think that she is lying at the moment, it is clearly more logical to assume that she is telling the truth because her entire job relies on the concept that she will report truthfully on the witness stand. In order for the claim that she is lying to be logically valid, you have to have evidence to support it. That’s how the burden of proof works. Now let’s apply this to science. When comparing hypotheses and attempting to understand the results of experiments, Occam’s razor tells us that we should default to the answer that makes the fewest assumptions unless we have a compelling, evidence-based reason for doing otherwise. Let me start with a neutral example. I recently wrote a paper on a study of the diet of a particular species of turtle. To conduct this research, I captured turtles in the field, waited for them to defecate into a bucket, then I examined their feces. In their feces, I found a variety of plants, insects, and crawfish. What’s the logical conclusion? As with the battery example, there are an infinite number of possible conclusions. I could, for example posit that they only eat plants but happened to eat a lot of plants that had insect and crawfish molts on them. I could also posit that someone when out before me, captured the turtles, force fed them crawfish, then put the turtles back into the pond just to screw with me. Similarly, I could again invoke aliens as an explanation. Obviously, however, the most rational explanation is that these turtles eat a variety of plants, insects, and crawfish, because that explanation makes the fewest assumptions. In this particular example, the other hypotheses are technically committing question begging fallacies. In other words, they are starting with the conclusion that these turtles only eat plants, then they are making unsupported premises to try to argue for that conclusion. This approach is not logically valid and it is one of the hallmarks of pseudoscience. Now, let me show how this works in a more contentious example. Young earth creationists argue that the entire world was destroyed in a flood roughly 4,500 years ago. As I plan on elaborating on more in a coming post, one of the big problems with this view is coral reefs. You see, corals are very sensitive, and even most creationists agree that reefs could not survive the flood. This means that all the corals we see today would have had to grow after the flood. The problem is that corals grow very slowly, and to get reefs the size that we see today, you would need a sustained growth rate that is many times faster than the fastest growth rates ever observed under ideal conditions (many reefs are estimated to be several hundred thousand years old). When faced with this problem, creationists generally respond by claiming that growth rates were much faster in the past than they are now. This is a perfect example of an ad hoc fallacy. Think about parsimony for a second, which explanation makes more unjustified assumptions? Corals do not grow nearly fast enough to form modern reefs in only 4,500 years, therefore there wasn’t a recent worldwide flood. Corals used to have a sustained growth rate that was many times faster than the fastest growth rate that we have ever observed even under ideal conditions, and for unknown reasons they no longer grow that fast. Clearly the second explanation is the one making unfounded assumptions. The burden of proof is on creationists to provide evidence that corals used to be able to grow much, much faster than they can today; whereas scientists don’t have to prove that they didn’t grow faster, because there is no a priori reason to think that they did. In other words, the only reason that anyone would accept creationists’ claim is if they already thought that the flood occurred. This is why the argument is not logically or scientifically valid. It starts with the assumption that the flood occurred, then it tries to make the evidence fit that assumption, but science always goes from evidence to a conclusion, never the other way around. Finally, I want to conclude this post by bringing Occam’s razor and the burden of proof to bear on the common conspiracy theorist claim that virtually all scientists are corrupt and are only in it for the money. For example, whenever I present anti-vaccers with the copious papers that show that vaccines do not cause autism, they invariably claim that all of the scientists involved in those papers were paid off by the pharmaceutical companies. Consider, which explanation makes more unfounded assumptions? Clearly the second one is the explanation that is making more unfounded assumptions. This is no different from the courtroom example. Just as the burden of proof was on the defense to prove that the expert witness was lying, even so, the burden of proof is on the anti-vaccers to prove that all of the scientists are paid off. Another way to think about this is to ask whether or not there is any reason to think that the scientists are corrupt other than simply the fact that you don’t like their conclusions. The answer is obviously that there is no a priori reason to think that all of them are corrupt. This same reasoning applies to people who claim that climate scientists are only in it for the money, that Monsanto has control over all the food scientists, etc. Anytime that you claim that a consensus is wrong, you have just placed the burden of proof on your shoulders. 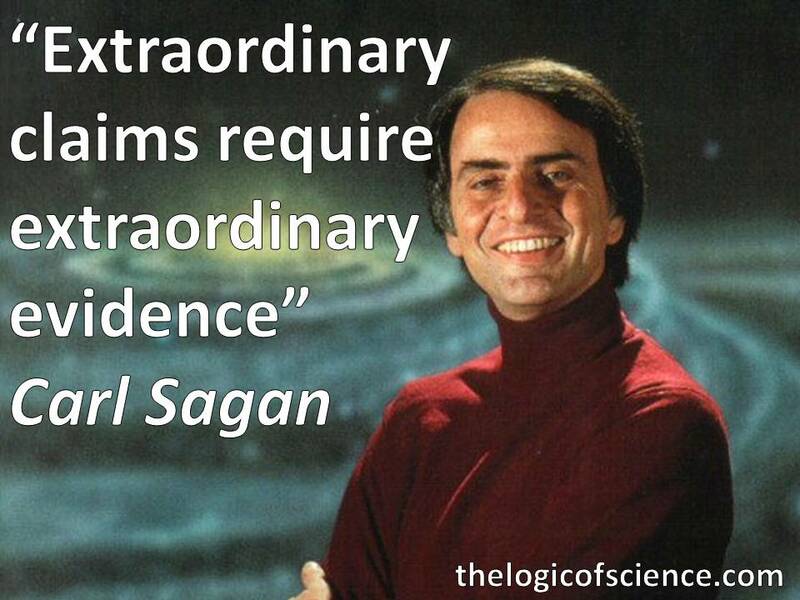 Carl Sagan said it best when he said that, “extraordinary claims require extraordinary evidence.” If you’re going to claim that the scientific consensus is wrong about climate change, vaccines, etc. you cannot get away with an unsupported cop out like, “warming is just a natural cycle” or “it’s a conspiracy.” The burden of proof is on you to provide clear and irrefutable evidence for your position. Until you can do that, logic and rational thought are not on your side. This entry was posted in Nature of Science, Rules of Logic and tagged Bad arguments, burden of proof, Occam's razor, rules of logic. Bookmark the permalink. I have read part 1 to 5 of The Rules of Logic now, and i just wanted to let you know that i think they are all great! They open up a whole new way of thinking and solving problems and i really think more people should read this. Keep up good work! Thanks! I hope that people will find them useful.